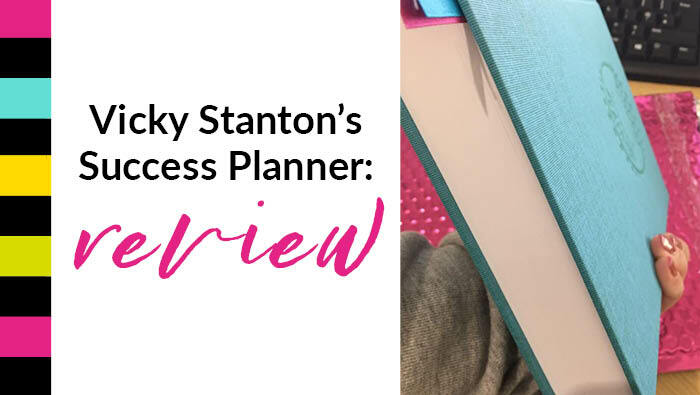 Need a perfect planner, then Vicky Stanton's Practical Planner is for you! If you’re anything like me then you love all things stationery. I could spend hours and hours lost on the internet swooning over notebooks, pens and planners. I’ve become a bit of a planner addict to be honest! And boy oh boy have I bought a few! It’s all trial and error. Finding the PERFECT planner for you and how you work. Having struggled to find a business planner that does everything one of my wonderful Brandistas, Vicky Stanton, decided to design her own. She’s designed a planner that makes you more profitable and productive. I was so excited when I received Vicky’s Success Planner in the post. It arrived in a gorgeous pink shiny envelope which concealed more gorgeousness inside – The Success Planner! Eeeek. First impressions – sturdy, well made, quality and a beautiful teal cover – which you just have to run your fingers over – it’s that kind of planner! It features two gorgeous silky pink and teal ribbons page markers enticing you to ‘open me’! It’s A5 so will fit in your handbag easily if you’re popping out to meet clients. Outlines a quick ‘how to use this planner’ guide with no waffle – straight to the point. It lays flat. This is a massive thing for me. This makes it really easy to write in and even up into December it still lays flat! Well thought out pages. Each day has its own page. On each page there’s space for appointments, notes, calls to make and a great tool called ABCD. Here you mark each action as Absolute must get done, Best Done, Can wait or Dump it. I love this. It includes a numbers tracker – not something I’ve seen in any of the other planners I’ve bought in the past. Here you can record your income, profits, social media likes, followers etc plus its all on one page which means you can review your progress in one place. Can’t wait to see what this looks like in the next 12 months. Tracking growth! I love this. Each section is split into 90 Day Plans. Something I do myself already so this is perfect for me. At the end of every 90 days there’s lots of space to write your achievements, highlight what worked and what didn’t, what you’re going to ditch and what your next 90 day plan looks like. There’s an action list at the beginning of every month. One for your personal life and one for your business and career. It features pages at the end of each month where you can review your month. And there’s lots of space for you to note what worked well, your biggest success and did you work effectively in the last month. It’s like a monthly round up. There’s bonuses pages which you can download from Vicky’s website. In a nutshell not only is The Success Planner designed to give you focus, clarity and purpose but it’s really practical and will make you jump into action. In the spirit of full disclosure, this is NOT an affiliate link, I am NOT on commission – Vicky is my customer and I love what she has produced here. I only recommend products and systems that I use and love myself.